Lung - Keratinizing cyst in a male F344/N rat from a chronic study. There is a large cyst filled with keratin. Lung - Keratinizing cyst in a male F344/N rat from a chronic study. The epithelium of the cyst wall is well differentiated, with orderly maturation of the cells. Lung - Keratinizing cyst in a female F344/N rat from a chronic study. There is a large, keratin-filled cyst. 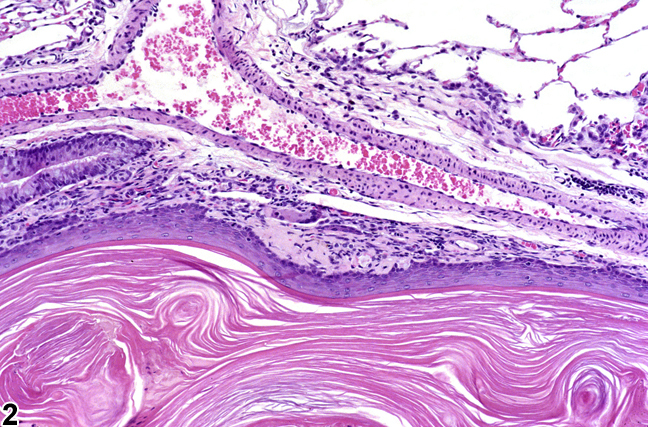 Lung - Keratinizing cyst in a female F344/N rat from a chronic study (higher magnification Figure 3). The epithelium in the wall of the cyst is well differentiated, with orderly maturation of the cells. 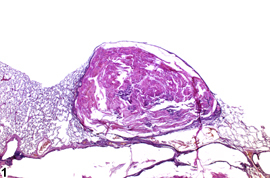 Keratinizing cysts are typically seen in rats after inhalation exposure to particulate material (e.g., talc, titanium dioxide), though they are also seen in rats exposed by gavage to dioxin-like compounds. They have not been reported in mice or hamsters. 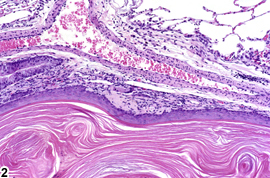 Keratinizing cysts consist of a cyst wall composed of well-differentiated squamous epithelial cells undergoing orderly maturation surrounding a lumen containing brightly eosinophilic, concentrically laminated keratin ( Figure 1 , Figure 2 , Figure 3 , and Figure 4 ). Cysts can be observed in any lung lobe and are often subpleural. Cysts can become quite large, up to several centimeters in diameter, and replace or compress the normal lung parenchyma. 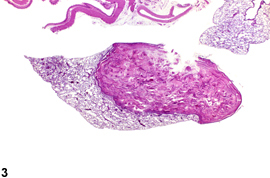 The squamous epithelial cells comprising the cyst are considered to originate from metaplasia of epithelium lining the alveoli and/or bronchioles. Keratinizing cysts have also been called "squamous cysts" and "epidermal cysts." 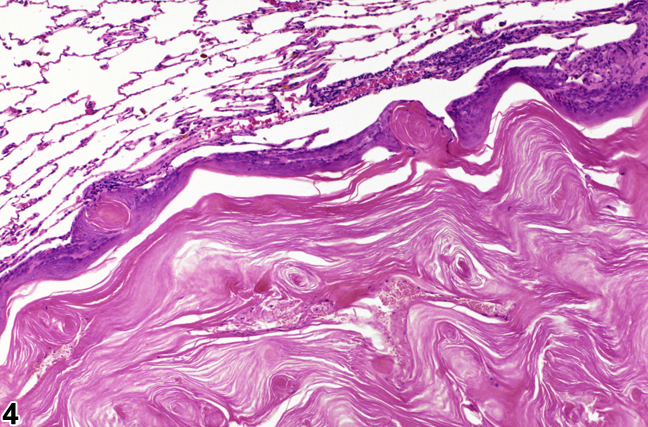 Keratinizing cysts are thought to be part of a continuum of keratinizing lesions seen in rats that also includes squamous metaplasia of the alveolar epithelium, cystic keratinizing epithelioma, and squamous cell carcinoma. Cystic keratinizing epitheliomas can be differentiated from keratinizing cysts by virtue of the thicker, more complex wall of epitheliomas, which has a rougher outer margin (cysts have a smoother outer margin) and may lack orderly maturation of the squamous epithelial cells and may have increased mitotic figures. Squamous cell carcinomas may appear similar to cystic keratinizing epitheliomas but show evidence of malignancy (invasion, cellular atypia, loss of cellular polarity, etc.). 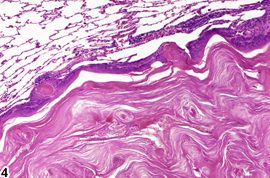 Congenital cystic spaces lined only by fibrous tissue have also been reported in the rat, and these are distinguishable from keratinizing cysts by the lack of squamous epithelium. Lung - keratinizing cyst should be diagnosed whenever present but should not be graded. However, if a dose-related increase in the number and/or size is present, and the pathologist feels that grading the cysts is necessary to fully characterize the relationship of the lesion to treatment, the cysts may be graded. If the cysts are graded, the grading scheme must be fully described in the pathology narrative. A description of the lobar distribution and approximate number and size of the cysts in the different dose groups should also be included in the pathology narrative. Associated lesions, such as inflammation, should be diagnosed separately. Boorman GA, Brockmann M, Carlton WW, Davis JM, Dungworth DL, Hahn FF, Mohr U, Reichhelm HB, Turusov VS, Wagner BM. 1996. Classification of cystic keratinizing squamous lesions of the rat lung: Report of a workshop. Toxicol Pathol 24:564-572. Boorman GA, Eustis SL. 1990. Lung. In: Pathology of the Fischer Rat: Reference and Atlas (Boorman GA, Eustis SL, Elwell MR, Montgomery CA, MacKenzie WF, eds). Academic Press, San Diego, CA, 339-367. Sells DM, Brix AE, Nyska A, Jokinen MP, Orzech DP, Walker NJ. 2007. Respiratory tract lesions in noninhalation studies. Toxicol Pathol 35:170-177.